Meritor: 12,000 – 14,600 lbs. Dana Spicer: 12,000 – 14,000 lbs. Spring Parabolic Taper Leaf: 12,000 – 14,600 lbs. Alternators: 12 Volt 160 – 185 Amp. Built with all your needs in mind, the International® 9900 highway tractor delivers on both style and performance with cutting-edge aerodynamics, ergonomic features, a 92" wide bunk, easy-to-read gauges and switches, and a best-in-class HVAC system. 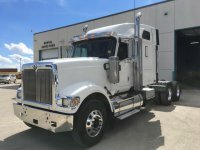 From its extra-wide sleeper to the wide-track axles for increased maneuverability, you’ll find yourself working comfortably and efficiently.